Mike Long, the elite athlete coordinator for Elite Racing, died last week and the sport lost a great man and great ambassador. 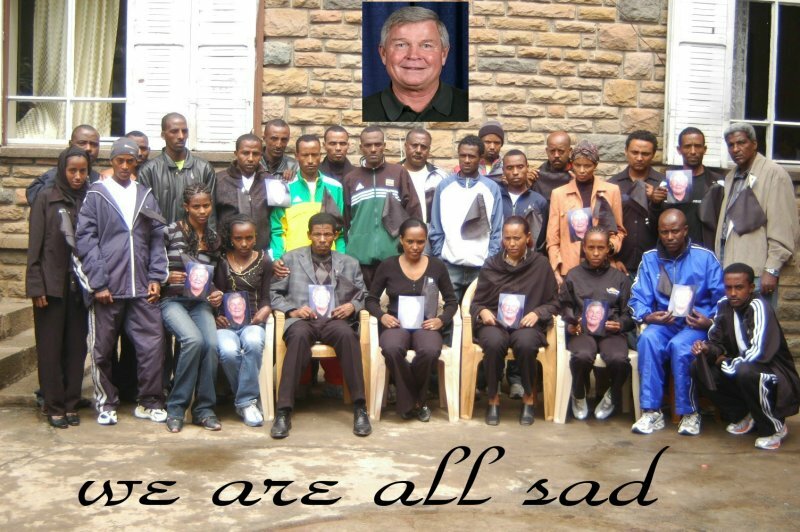 We received this photo which was taken at the Global Athletics offices in Ethiopia and the photo touched us as it showed how deeply Mike will be missed throughout the world. 27 people including some of the greatest athletes in the world including Haile Gebrselassie, Meseret Defar, Tirunesh Dibaba, and Gezahegne Abera all took the time to get together and honor a man who died half way across the globe. This photo shows not only what a great person Mike was but also perhaps why Mike had such a great love of the Ethiopian people. Mike set up a non-profit charity, Entoto, to help the Ethiopian people and if you were touched by Mike or by the stories of Mike on our message board consider a donation to Entoto. And in case you didn't know, Mike was a fan of letsrun.com. We received a few emails talking about his affinity for letsrun.com, inclucing this one: "Anyone who spent any time with Mike in office can tell you there were three things he checked on religiously: his email, his stocks and letsrun.com." Personally, when I heard the news of Mike's death I was upset. My initial thought was probably similar to those of many others, "I really liked that guy". Ever since then I've been trying to rack my brain, but I only remember meeting Mike and spending any time with him one time (I know I must have seen him more times than that). I keep thinking there must have been more times I interacted with him as there is no way I could be that impressed with someone I barely knew, but as the testimonials to Mike show he had a positive impact on a lot of people. So in tribute to Mike consider a donation to Entoto, but also go about the day with a smile on your face or a kind word for a stranger. The impact it has may be much bigger than you imagine. Front row: -Mulu Seboka - Mulu was fourth in both this year's PF Chang's Rock 'n' Roll AZ and Rock 'n' Roll San Diego. She won the Mumbai Marathon last year. At PF Chang's, we realized that it was her birthday that week and Mike took all the Ethiopians out to a country western restaurant. -Ejegayehu Dibaba - 2004 Olympic 10000m silver medalist, she was 8th at Carlsbad 2003. -Haile Gebrselassie - Haile had been friends with Mike for many years, and had hosted Mike at his home in Addis on several occasions. He had promised Mike that he would run one of Elite's races and came through with a WR in the half marathon at PF Chang's in 2006. -Derartu Tulu - Olympic 10000m champion in 1992 and 2000 and 10000m World Champion in 2001. -Gezahegne Abera - 2000 Olympic and 2001 World Champion. He would often come to Rock 'n' Roll San Diego as a guest of Mike's, including this past June. -Tekeste Kebede - Third in Rock 'n' Roll San Diego in 2004 and fifth in 2006. He also ran the 2005 Virginia Beach and Philadelphia Half Marathons. -Habte Jifar - 3rd in 2006 PF Chang Half Marathon, ran 2007 PF Chang's Marathon. Rabbit in Geb's 26:22 10000m WR.